What to Name the Church? 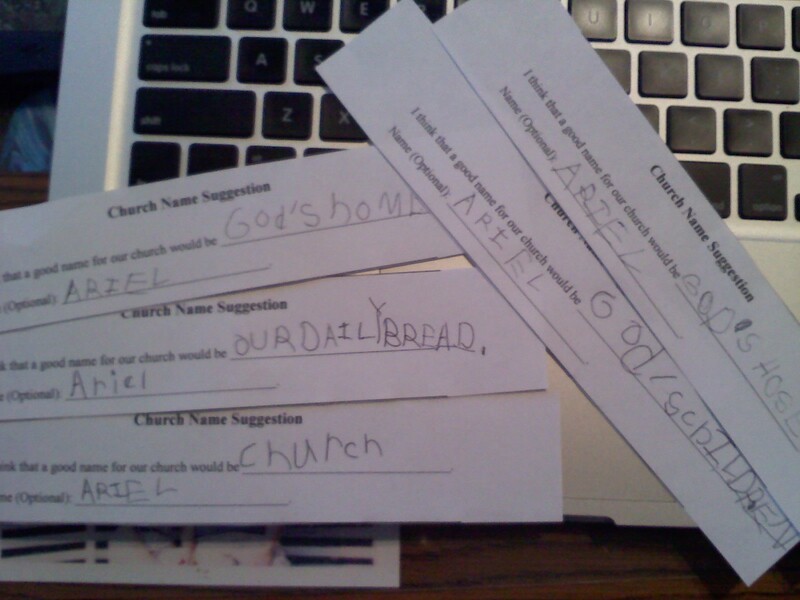 Over the past couple of weeks, we have started taking suggestions for the name of our merged congregation. As you can see, our five year old daughter has really taken the task in hand and continually submits ideas. Some of the suggestions have been good, but the elders have had some more-or-less unwritten guidelines as we’ve sifted through them. The name has to reflect the vision Jesus has for the church and not just a label. The name needs to be different from the names of the two congregations that came together to form our church. It has to be easily abbreviated without becoming an acronym (i.e. HBC, GBC). It has to be different and thought-provoking. Although we’ve gotten several suggestions like “The Church on Bedford Road” or “Unity Church”, we’ve set them aside. We are still working on it, and we really hope to have a short list for the church by the end of March. Unfortunately, I don’t think any of Ariel’s suggestions will be on the list.